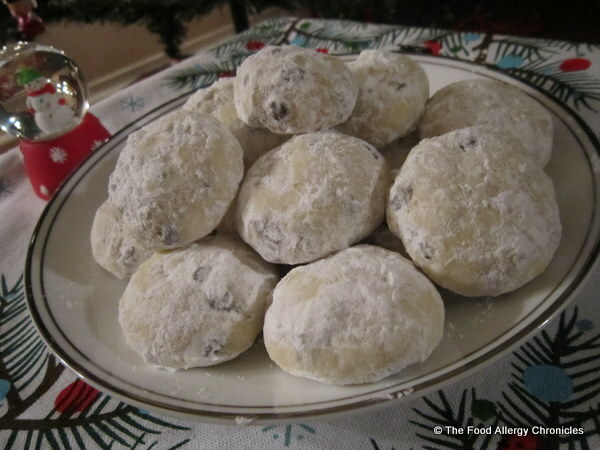 Posted on December 14, 2011 by Susan H.
Dairy, Egg and Peanut/Tree Nut Free Chocolate Chip Snowballs. I grew up loving anything ‘shortbreadish.’ Not too sweet and extremely versatile. Sugar Cookie cut outs were a favourite as were my mother’s Pecan Balls. The next thing I knew, we were whipping up an adapted version…eureka…we have a winner! This recipe hails from Canadian Living’s 1977 special edition magazine they put out that year. The recipe was called ‘Quick and Easy Holiday Cookies’. I can still remember all the variations of cookies that could be made with this dough. I just loved gazing at all the cookies. My mother still owns her copy! How appropriate that my reinvented childhood recipe be paired in a picture with my childhood christmas tree ornaments. Don’t you love the colours! In a large bowl, cream the Earth Balance and sugar until light and fluffy. Stir in the vanilla and water. In another bowl, combine the flour, baking soda and salt. Gradually add the flour mixture to the creamed mixture until combined. Add chocolate chips to half the dough. 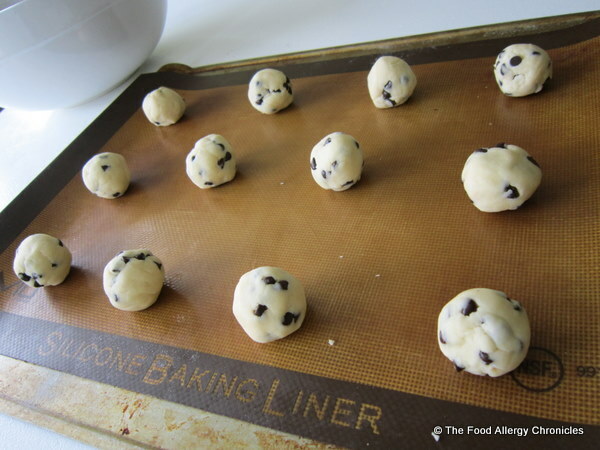 Roll a tablespoon of dough into a ball and place on cookie sheet lined with parchment paper or a silicone pad. 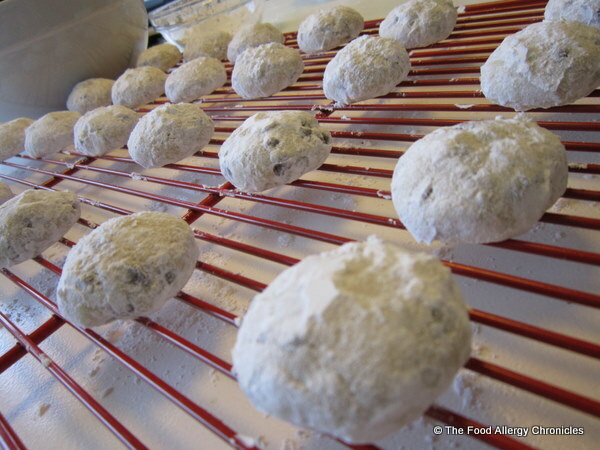 Roll cookies in icing sugar while still warm and let finish cooling on rack. Roll once again in icing sugar once fully cooled. Makes approximately 24 cookies and one snowman! P.S. I had to add Michael’s comment on the cookies…”Mmmm…these are good…really good…I don’t remember them tasting this good!” Too funny! P.P.S. Have you reinvented an allergy free version of a childhood favourite for your children? This entry was posted in baking, christmas baking, cookies, dairy free, dessert, egg free, multiple food allergies, peanut/tree nut free, sesame free and tagged allergen free christmas cookies, christmas baking, christmas cookies, dairy egg and peanut/tree nut free chocolate chip snowball cookies, earth balance vegan sticks, enjoy life chocolate chips by Susan H.. Bookmark the permalink. Thank you for this recipe! 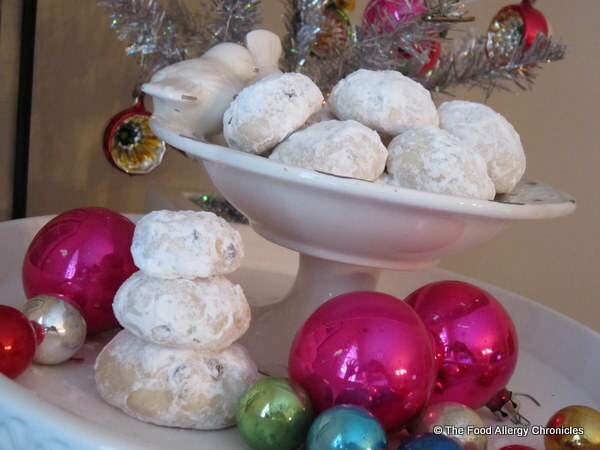 What a great idea… my mom also used to make pecan balls dusted with icing sugar – they were a family favourite. What a great idea to add choc. chips instead of pecans! Matthew thinks everything tastes better with a little bit of chocolate in it! Stay tuned for Friday’s post when I use the other half of this recipe in another family favourite! Perhaps too much time spent in the kitchen baking! lol So busy with holiday baking that the Rice Krispie container has gone empty…with little complaints! Oh Susan, those look so tasty I could eat them off my screen LOL. I have a recipe that is similar that includes chopped nuts, which I now know that your children cannot have. I haven’t posted it yet, but will shortly after Christmas. And then of course, in our case, we have to have the GF flour blend. Thanks for visiting my blog. I enjoyed your comments 🙂 Have a wonderful weekend! Hi Mary! 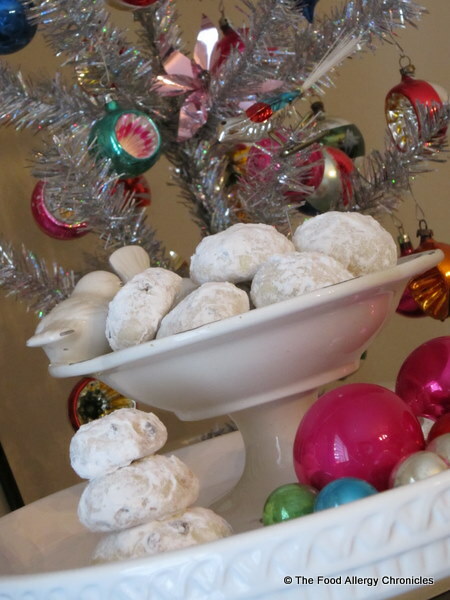 My mother’s Pecan Balls were the inspiration for this recipe…it is now the favourite holiday cookie! 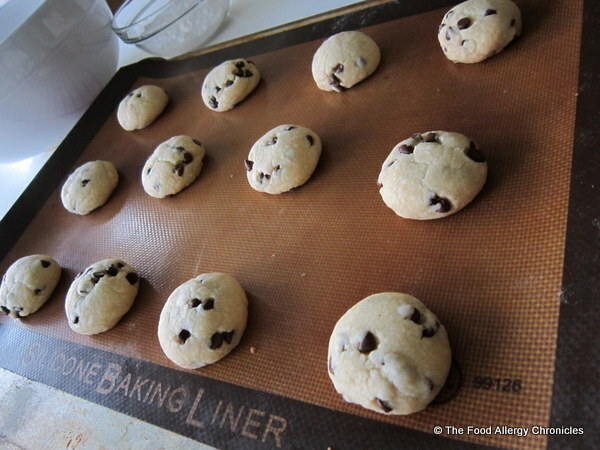 I am interested in GF flour blend cookies…a friend of mine’s 2 year old son is allergic to wheat. I will be busy this weekend baking my mother’s adapted version of her Orange Shortbread…with my mother. Thank you for your comment. Susan H.
This looks great! I am excited to try to make it. I just wondered do you mix the Earth’s Balance with Icing Sugar, or regular sugar? I saw you only had icing sugar under the ingredients. Thanks!!! Hi Angela! Yes, the sugar in this recipe is icing sugar…and then extra to roll them in…yummy! These cookies are my boys’ favourite during the holidays. Enjoy! Susan H.
I googled Earth Balance and they have several products, which product are you using in this recipe? Milk, buttery stuff?